For my first review, I’m going with the gorgeous Colors by Llarowe “Dirty Diana”! As for application, this is two coats with G&G HK Girl top coat. I could have definitely gotten away with one coat, though. With topcoat, the wear time on this polish is pretty fantastic- I’m at five days with zero chips and will probably go for a few more before witching things up. Although the CbLs tend to be a little bit on the thicker side, application is super smooth and easy. This polish makes me feel totally spoiled (it’s so easy, even I can do it!). 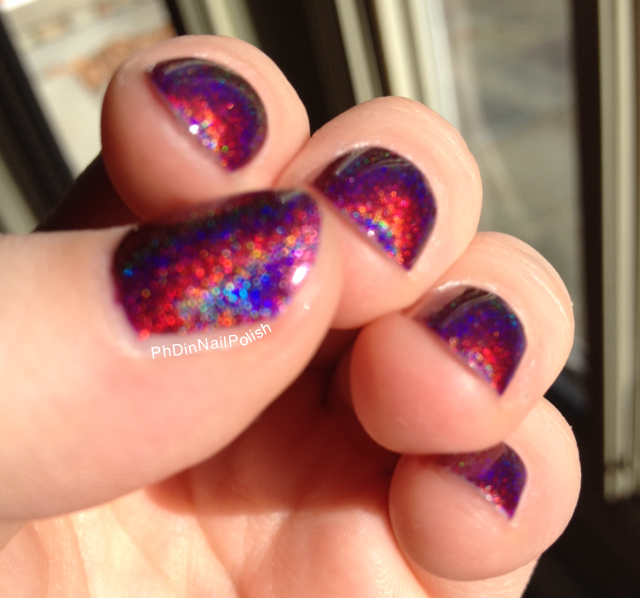 Inside during the day, this polish shows off its purple and blue tones (above), and at night the reddish tones really come out. For your viewing and sharing pleasure, I’ve also included a collage version of a few of the eighty million pictures I took in varying light (I’m like a nail Narcissus). This bad boy (girl? I guess it is Diana) can be purchased at www.llarowe.com (your best bet is a pre-order or restock day, which are announced via the Llarowe facebook page, email newsletter, or on the site itself).